Ratatouille is an animated children’s feature that centers on Rémy, a fastidious and selective creature in a rotten world who finds himself with an opportunity to assist in the very kitchen of the Paris chef who has inspired his love of food. The problem: Rémy’s a rat, and rats and restaurants haven’t gotten along well, historically speaking. The resourceful Rémy finds a way to cook that involves great risks if things go awry, and naturally, things do. 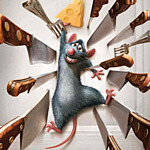 When Remy learns that his inspiring favorite TV chef has died and his likeness is now being used to sell microwaved meals (“BBQ Dip N’ Ribs,” “Chopsocky Pockets,” and “Tooth Pick’n Chicken”), the rat is incensed and decides to do what he can to help, despite having to leave his family in the process. Whether going against one’s nature is the right thing to do is one of the themes I chewed on during this entertaining and enlightening tour of the kitchen of a fancy restaurant. Rémy is eager to be more than a thief — he wants to make things, for which all the other rats mock him. Rémy’s ally, the young Linguini, is an amateur in the kitchen, which poses some ethical dilemmas. My daughter didn’t care about any of these larger issues; she was excited to see the story was set in Paris, and she liked the elaborate chase sequences and the puppetmaster rat. Dedicated foodies will love the care that has clearly gone into the fictional world of Ratatouille: real-life star chef Thomas Keller of Napa’s celebrated restaurant The French Laundry consulted with the animators at Pixar on the menus and kitchen designs, and the filmmakers lavished equal care on other details, as well (making fine food look realistically good but not freakish; and making rotten food look bad in the right ways, for example). By the end, the “little chef’s” deconstructed version of ratatouille, Keller’s reinterpreted peasant dish of eggplant, peppers, squash, and tomatoes, even enraptures the creepy critic Anton Ego (Peter O’Toole), who delivers one of the best monologues ever on the relationship between critics, artists, and the audiences they serve. About six months ago, as part of my research for a novel I am writing, I checked out a hefty stack of books at the library that included a series of books about chefs and cooking, about what kitchens are really like behind the swinging doors; and one about Bernard L’Oiseau, the famed Paris chef who committed suicide not long after his restaurant lost two of its three Michelin Guide stars. Brad Bird (The Incredibles, The Iron Giant), who wrote and directed Pixar’s new animated film, Ratatouille, must have read all the same books long before I did, because it’s all in the screenplay: the amateur in a professional kitchen; the rapture and the hard work that fine food can inspire; and the famous chef whose restaurant slides into mediocrity (and has committed suicide, a fact mentioned once briefly that thankfully went right over my seven-year-old’s head). My guess, however, is that most of the people who will see this film in this country don’t have a lot of context for this material, lacking many opportunities to go to fine restaurants. People avoid restaurants like the one portrayed in Ratatouille not only because the meals tend to be prohibitively expensive but also because eating outside their comfort zones is a stressful experience rather than an enjoyable one. Not only do I doubt this film will shift this crowd any nearer to cooking or going out for fancy foods but I also imagine all the fuss over food could mystify and befuddle those same people. As I watched the culinary adventures of the rodent gastronome, I wondered whether Pixar’s latest, in pulling away from kid territory (cars, toys, monsters, bugs) and dipping into the world of haute cuisine, will inspire a whole new generation to pay the kind of attention to food that you can usually find only at the tables of fine restaurants and the occasional ambitious home cook. If the movie does inspire, I honestly think it will be a handful of adults who will decide to try cooking an elaborate French dish at home; but the kids will be more likely to ask their parents for a pet rat than to pick up some brie and fruit so they can do Rémy’s taste test: trying first one, then the other, and then (drumroll, please) together! While the “anyone can cook” motif is meant to be profound and inspiring, perhaps I had already been inspired enough by that stack of books that the film often felt more like boilerplate — inspiring stuff thrown into the story when the hero needs a boost. I had this reaction even when the advice was excellent (like “Cooking is for the imaginative, the strong of heart. Only the fearless can be truly great” — it reminded me of when someone once gave me this piece of invaluable advice: “You must be decisive to cook a fried egg”). People who aren’t so enthralled by chefs and food might find this story a bit long (my six-year-old was asking me if it was over, twenty minutes before the end of the film, as she did last summer when we saw Cars), and there are some unpleasant (some might even say horrifying) images of vast numbers of rats flowing in and out of kitchens. If none of this puts you off, you will want to see Ratatouille — just don’t go with an empty stomach.